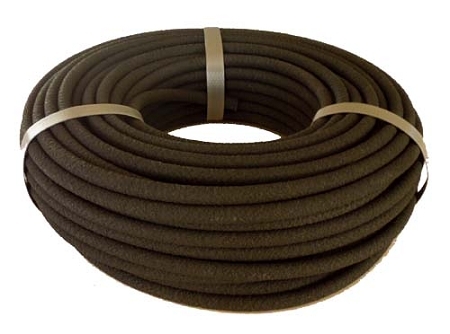 1/4" Bulk Soaker Hose Bulk Soaker Hose offers the perfect delivery of water to plants. Made from recycled materials, 70% from recycled rubber and 30% recycled polyethylene products that are re-pelletized for use in the process. Being "bulk" Soaker Hose means there are no fittings on the hose. In turn, you can cut to desired lengths to create your own custom system. 1/4" Soaker Hose is ideal for watering flowers, vegetables and looped around trees and shrubs. Can be used in small areas such as pots, planters and window boxes. Water in lengths up to 15'. However, it is acceptable to feed water from solid pipe into a 1/4" tee then branch into two 15' runs or form a circle with a 30' circumference. GPH is approx. 65 gallons per hour, per 50' at 25 psi, depending on inlet pressure & water hardness. ¼” Soaker Hose uses ¼ inch barbed Fittings Click Here! Soaker Hose should be used on flat surface not exceeding a 2' rise over 100'. A pressure regulator is a MUST since Soaker Hose is designed to work at low pressure. (25 PSI) We recommend using a soaker hose pressure regulator, 200 mesh filter, backflow preventer to help separate particles and prevent the hose from clogging. Areas with hard water should consider using a calcium filter as well. This is the size normally used in clay soils around foundations, usually in the great state of Texas. Please be sure this is the size you want. Shipping is expensive to return it, as the hose is heavy. If you are not sure, please send us a message.